Donaueschinger Musiktage ’94, hosted by the SWR under the slogan "Poetry of Abstraction". 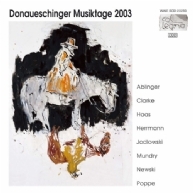 The recording of the Donaueschinger Musiktage 1993 presented by col legno! The Donaueschinger Musiktage 2005, Vol. 3!